The opening chord to A Hard Day’s Night is also famous because for 40 years, no one quite knew exactly what chord Harrison was playing. Musicians, scholars and amateur guitar players alike had all come up with their own theories, but it took a Dalhousie mathematician to figure out the exact formula. Four years ago, inspired by reading news coverage about the song’s 40th anniversary, Dr. Brown decided to try and see if he could apply a mathematical calculation known as Fourier transform to solve the Beatles’ riddle. The process allowed him to decompose the sound into its original frequencies using computer software and parse out which notes were on the record. Dr. Brown deduces that another George—George Martin, the Beatles producer—also played on the chord, adding a piano chord that included an F note impossible to play with the other notes on the guitar. The resulting chord was completely different than anything found in the literature about the song to date, which is one reason why Dr. Brown’s findings garnered international attention. 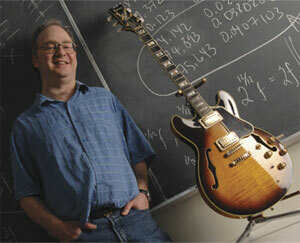 He laughs that he may be the only mathematician ever to be published in Guitar Player magazine.